Airport Lounge Access: How Do You Get it and at What Cost? Have you ever been stuck waiting for a flight in an overcrowded terminal with overpriced food and drinks, unbearable noise, and nowhere to plug-in your phone? You are not alone. But there is a solution: get access to an airport lounge. In this post we will compare the lounge access benefits offered by a variety of credit cards. A warning in advance: they all come with a $450 fee. But the lounge access and all the other benefits you get are worth it for many travelers. The sign-up bonus alone usually pays for a free flight. To see of one of these cards is the best choice to help you fund the flight of your dreams, register at RewardExpert. There are two major categories of cards which come with airport lounge access benefits. Regardless of which category the following cards fall into, they all carry high annual fees and therefore only make sense for travelers who can make frequent use of the benefits. Each of the three legacy U.S. carriers offers a high-end co-branded card via their banking partners. The table below summarizes the benefits and fees associated with these cards. The Delta Reserve card has by far the stingiest lounge benefits of the three cards compared here. This is the only one of them that offers access instead of a full membership. You may only access Sky Clubs when you are traveling on a same-day ticket on a Delta operated or coded flight. There are no complimentary guest privileges. You may bring up to two guests and children under 21 years of age at a discounted rate of $29 per person. Additional guests will cost the standard Sky Club rate, which varies. Lastly, lounge access is valid only at Sky Clubs; codeshare partners and SkyTeam alliance members are not included. The AA Executive card has the most generous lounge benefits of the three. The primary cardmember receives a full Admirals Club membership. This grants entry to Admirals Clubs, even when not flying on American Airlines, as well as entry into the Arrivals Lounge, Flagship lounges, and oneworld alliance partner lounges. You can also bring in immediate family or up to two guests for free. In addition, authorized users get complimentary Admirals Club access, even when not traveling with the primary cardmember. This can be a really valuable benefit because it is free to add up to 10 authorized users per account. Authorized users can also bring in two guests for free, so you can significantly multiply the total number of people you can get into lounges using this benefit. 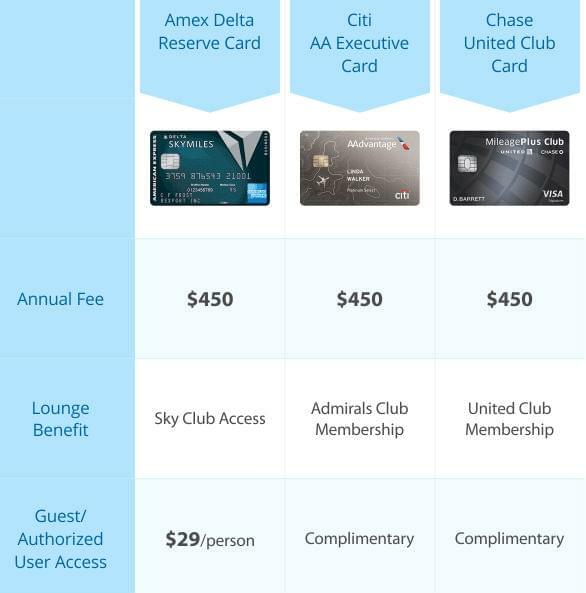 One more key distinction: Citi has their own definition of “access privileges” for this card: authorized users can access Admirals Clubs even when not flying on American, but do not have access to any of the other lounges mentioned above. The United Club card has more generous lounge benefits than the Delta Reserve card, but not as good as the AA Executive card. The primary cardmember receives a full United Club membership. This allows for access to United Clubs along with complimentary access for up to two guests or your children, even when you are not flying on United. You also get access to Star Alliance partner lounges along with complimentary access for one guest. The area where this card falls short of the AA Executive card is for authorized users. Authorized users do not receive their own membership; they are only eligible for United Club access when traveling with the primary cardmember. The three primary travel reward credit card issuing banks each have their own premium card which offers at least one lounge access benefit. The table below summarizes the lounge benefits and fees associated with each. The Platinum card from American Express offers a nice variety of lounge benefits. 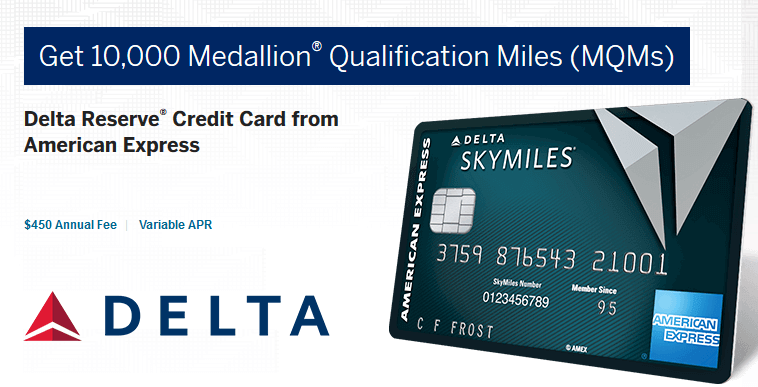 This card offers access to both Priority Pass lounges and Delta Sky Clubs. However, neither of these benefits comes with complimentary guest privileges. Guests cost $27 per person at Priority Pass lounges while guest costs at Sky Clubs follow individual Club policies. Centurion Lounges are a small but growing network of lounges developed and owned by American Express (there are currently seven of these lounges). By nearly all accounts these are some of the best lounges in the world, with high quality food and complimentary premium alcoholic beverages. Cardmembers may take up to two guests or immediate family into Centurion Lounges for free. Lastly, the Airspace Lounge network is a small network of three lounges, but cardmembers may also take up to two guests into these lounges, free of charge. 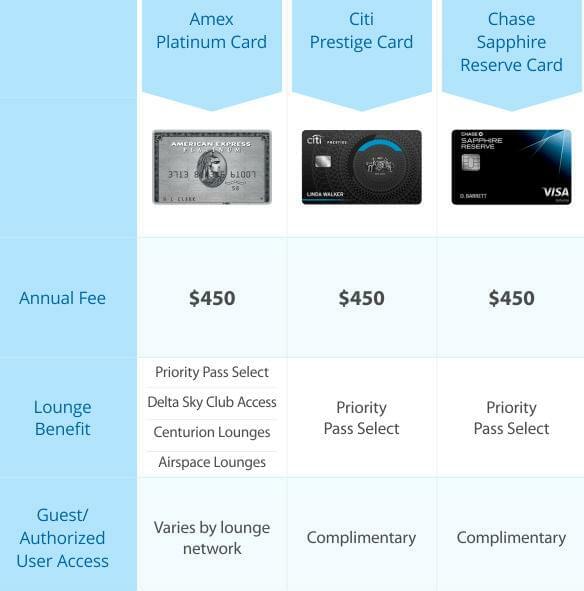 The Citi Prestige card recently suffered a massive devaluation that included the removal of Admirals Club access. However, it does still offer Priority Pass Select access. This includes complimentary access for up to two guests or immediate family members. The Chase Sapphire Reserve card also comes with a Priority Pass Select membership. This benefit comes with complimentary guest privileges, but the terms and conditions don’t specify a specific number of guests, rather stating that individual lounges reserve the right to limit the number of guests. Lounge access can make air travel far more enjoyable, and with the information in this article you should be able to decide which card offers the best lounge access benefits to suit your needs. You might want to carry two for expanded lounge access and additional travel credits and benefits.